Pleasanton, Calif. (Sept. 23, 2017) – California stallion Gig Harbor was represented by his first winner on Saturday. 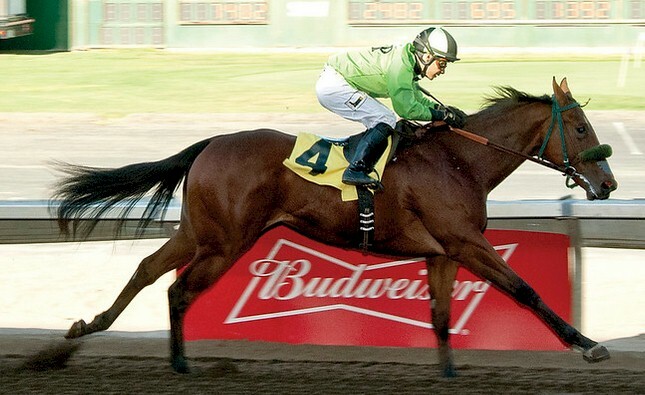 Perfect for Me, a filly by Gig Harbor, won Saturday’s seventh race at Oak Tree at Pleasanton, a maiden special weight for 2-year-old fillies in her second outing. She is from the Royal Academy mare Noe Valley, was bred by Christy Wiebe & Dennis Patterson, is owned by Patterson and trained by Steven Specht. She ran the 5.5 furlongs in 1:06.35 and won by one length at odds of 5-1. Gig Harbor is out of the St Jovite broodmare Miss Blue Grass. He is a multiple stakes winner and is by the up and coming, now deceased, sire of sires City Zip.